Ironically it's 66 degrees here in Miami - which in case ya didn't know - is *not* typical spring weather here. We usually just jump from winter to summer in the blink of an eye. However, that's not the case today, and I'm enjoying these cooler temps with a hot chocolate in hand, until summer really hits us in the face. 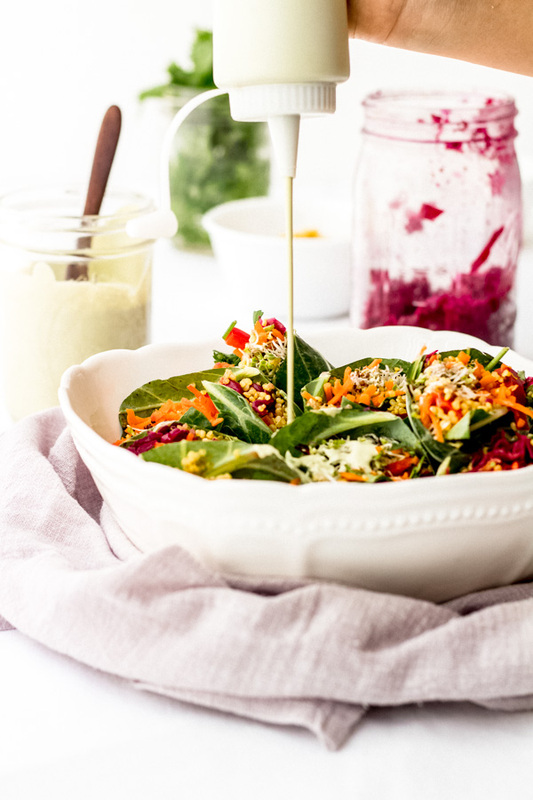 I love this recipe so much, mostly because of all the colorful veggies that I usually throw into the mix, but also because it's pretty simple and straightforward to make, and also it's like super duper healthy. If there are some veggies you aren't a big fan of, say carrots, or bell peppers or sprouts... i encourage you to chop them all up and throw them into a wrap... drizzle a tasty sauce on top (in this case we're using a deliciousss cilantro sunflower seed sauce) and you'll be chowing down on that veggie wrap without even noticing what's inside! full of garlicky cilantro flavor! one step process - throw everything in the blender and blend! I provide a sample recipe for how to make the wraps but really, please, let your creativity run wild. This is more of a process, and less of a recipe. You can add whatever veggies you have on hand, or leave out which ever ones you don't like. 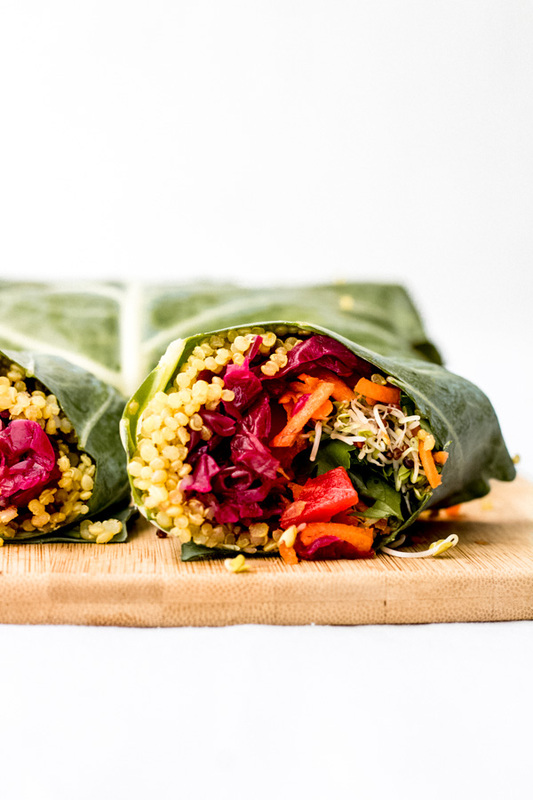 If you prefer to keep these as raw vegan collard wraps then totally leave the cooked quinoa out of the mix and enjoy the wraps stuffed with raw veggies instead. It's up to YOU! I decided to add some curry flavor to the quinoa to spice things up.. of course you can just use regular cooked quinoa as well but the curry spice really brings out the flavor in this wrap so I encourage you to try it. There are several types of curry powders out there, in this instance I used the one called 'Muchi' curry which tends to be a little more spicy than traditional curry so keep that in mind. 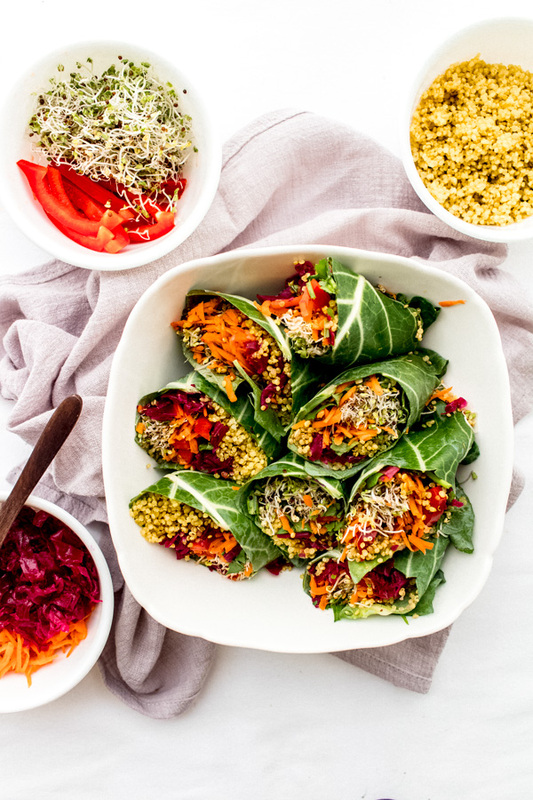 Obviously due to the freshness of these wraps, they're best enjoyed immediately after preparing as they may become a bit soggy after sitting in the fridge for a while. I include an option for vegan walnut meat - again, this is totally optional and if you're feeling like being extra because it does add more steps to the recipe as you'll have to prepare the walnut meat. But hey, if you have left overs from another meal, then this is a great recipe to throw in those left overs and make good use of them. If you know how to fold burritos - then the same basic principles apply to collard wraps, but don't forget to trim the middle stem slightly for extra pliability of the wrap. If you don't know how to fold a burrito - then watch this short video over on youtube that teaches you how to fold collard wraps in less than a minute. 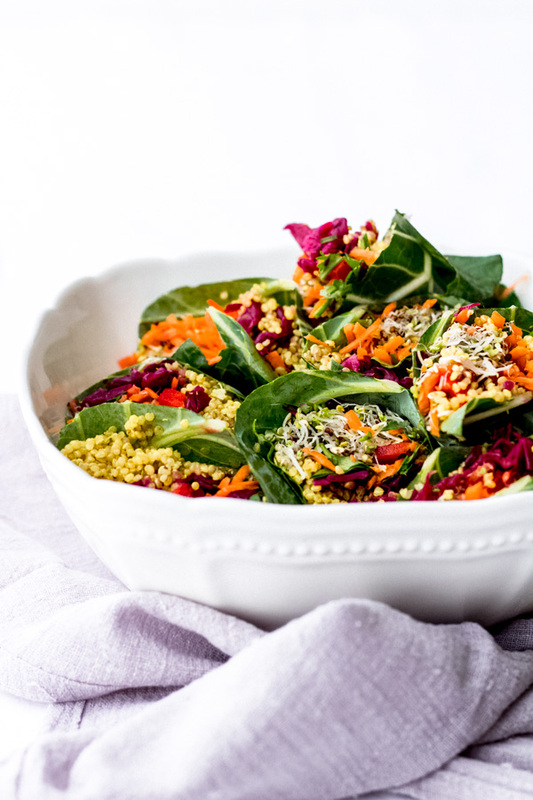 Want to see more vegan spring recipes? Make the quinoa. Bring 1.5 cups of water to a boil, and add 1 cup of dry quinoa, salt, and muchi curry powder. Bring down the heat to a low simmer and cook until quinoa is dry and fluffy. For more details on how to cook quinoa check out this post. Prepare the veggies. Slice the bell peppers, chop the spinach, cut up the avocados, shred the carrots (I use a food processor with a shredding blade for this) and prepare the rest of the fillings such as sprouts, sauerkraut and walnut meat. 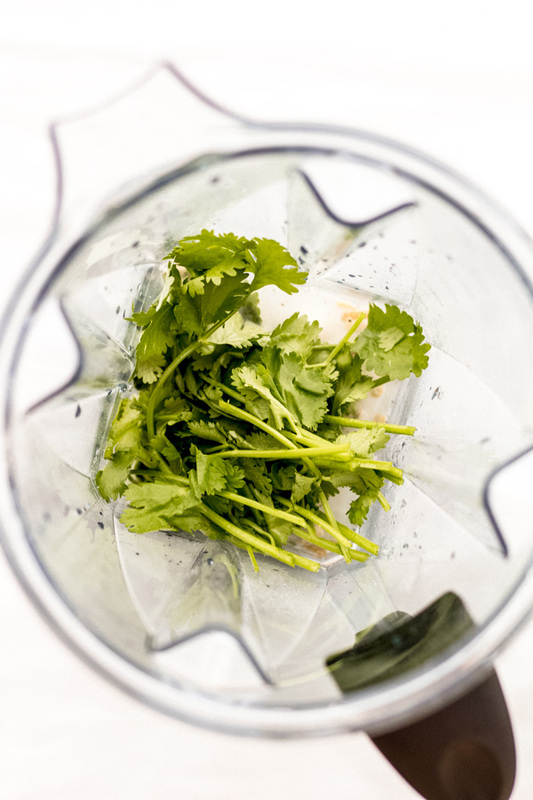 Make the cilantro sunflower sauce. Add all ingredients to a blender and combine until smooth. 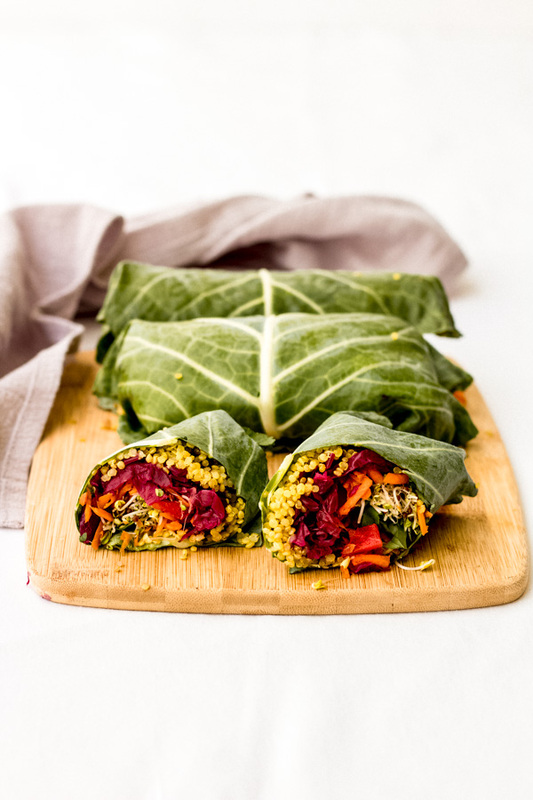 Stuff the wraps using collard green leaves – I like to start off with the quinoa first as a base and then start topping it off with the veggies, add some sauce, and roll them up. 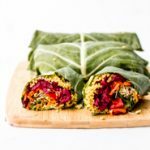 Collard greens are a little tricky because they break much easier than tortillas, but you can watch this video that really helped me learn how to roll them. The biggest takeaway I have is to trim the middle stem a bit with a pairing knife because this will help the leaves be more flexible and less likely to break. Cut wraps in half, top with some tasty cilantro sunflower seed sauce and enjoy! Sometimes talking about food gets a little repetitive for me. And I lose inspiration for writing. So I'm trying something new today - a small little section called 'zenful thought of the day' where I'll talk about something else *other* than food for a change. If you've made it all the way down here, thank you. I appreciate you.